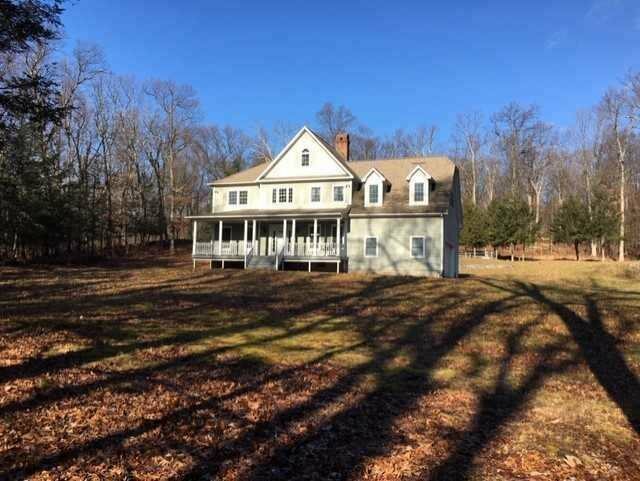 Privately situated on over 5 acres, resting gently on a knoll, this 4 bedroom well-built home offering a first floor office and 21 x 14 bonus room is sure to accommodate a large family. A spacious two floor foyer is entered from the front porch with views of the great room and grounds beyond. The great room features a fieldstone floor to ceiling wood burning fireplace. The 16x12 formal dining room will easily accommodate dining for 12 or more and is finished with elegant wainscot. The country kitchen, with light wood cabinetry, is open to a 13 x 14 sitting area or dine-in with glass doors creating a nice indoor outdoor connection. The entire first floor is bright and spacious with 9 foot ceilings, generously scaled windows and wood flooring. The pool was designed so as not to be seen directly from the house by positioning it a slight elevation and using stone walls built into the landscape.